This website is intended to provide information about the MiFILE project to both court users and filers that are submitting documents to a court. More information about the project can be found at the State of Michigan e-filing website. MiFile is a project being implemented by the State of Michigan judicial branch to bring electronic filing (e-filing) to all of the Michigan Trial Courts. In addition, the project also provides an optional cloud-based Document Management System (DMS) to the courts to allow the storage, retrieval and workflow routing of electronic documents. The project is being implemented under the Michigan State Court Administrative Office (SCAO) and the vendor implementing the project is ImageSoft, Inc. of Southfield, MI. 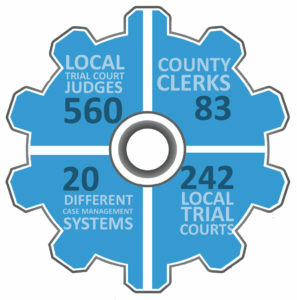 The project started in the summer of 2017, with an initial phase to convert 5 pilot courts to a new version of ImageSoft’s TrueFiling e-filing system. New Filers should click here. Click here to see the full rollout schedule.